Jive is at the core of your organizations social collaboration for several years now. However, like million others you have already rode the Office 365 wave and with that you have acquired a rich set of social collaboration features like Yammer and Groups. This compels you to reevaluate your social collaboration strategy around Jive. You want to create a unified collaboration strategy avoiding confusions as well as save on application management and licensing cost. Migration from Jive sounds like a low hanging fruit for you. You are almost right with your thought process, however there are several things to consider as you prepare for the migration. Looking to migrate from Jive to Office 365? Download Free Datasheet Here! Yammer is an open space to connect, share within the company, With Yammer integrated groups I can start discussions based on documents, create and participate in discussions, questions, documents, start my blog site and more. With the new capabilities of Yammer users can now share and play videos from Office 365 Video and Microsoft Stream directly within their Yammer conversations. Yammer and Office 365 Groups together they deliver powerful connections and discoveries of people, content and information. Yammer groups can now be more easily managed through dynamic group membership that updates automatically as people join, leave or move within organizations. Staying connected requires versatile tools, Microsoft Yammer apps are now for iPad, Windows and Mac. I can connect from whatever the device I feel most suitable. If you are thinking to migrate your content to Office365, then several important considerations you need to take into account. In the following sections I am listing out these items in order of migration steps. Yammer API does not support retaining of authorship information during creating posts. Also, original timestamp cannot be applied in the posts when created through API. To overcome these scenarios, we came up with custom solutions and approved by the client prior to the migration. Sometimes OOTB solution does not suffice for all the requirement, so if any specific customization required then with the OOTB solution add your required customization. In my experience it helps the end user to get accustom with the new target environment. Go for a deep content inventory analysis of all entities likes users with their permissions, places, (Spaces, Groups, Projects, …) and content (discussions, files (binary & collaborative), attachments, …) in Jive and then analyze the content. Generally, your migration partner presents the analysis through a Power BI dashboard, which helps the you to take decision on migration. When you are migrating, that is the perfect time to decide which content to move, merge or archive. 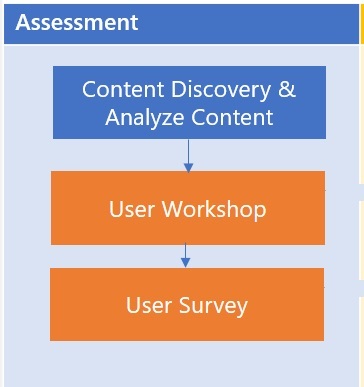 Go for a User workshop and user Survey to identify the content which really required to migrate in the target location. 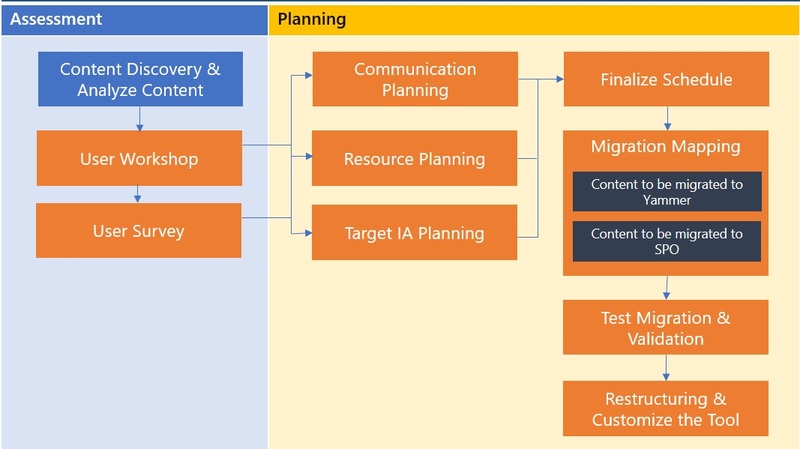 Migration gives the opportunity to rearrange your information architecture in the target. Once you are ready with the inventory, now the time is for object mapping. Map each Jive entities with best possible entities in Yammer / O365 group. Here is a high-level mapping, this may help you to visualize your content in target. Schedule migration plans keeping in mind to accommodate the business needs. Based on the usage and volume, migrate content in Big Bang or in Phases. Ask the users while scheduling to pick up their most suitable waves, which will minimize their effective business downtime. This leads to a smooth migration. Full testing with source & target using Selenium script before release for UAT - this is the best possible scenario before UAT. Key of all successful migration is user adaptability. Work with your migration partner to customize the target environment based on the usage. Most preferred customization is customized home page, this makes the user familiar. And sometimes create custom apps to help the user to find their content easily. 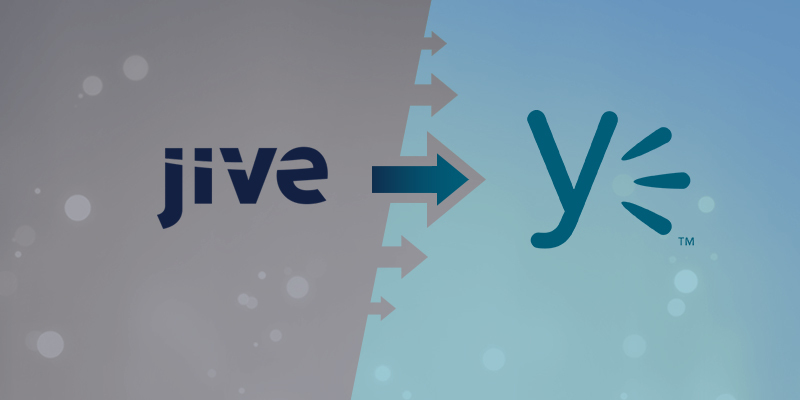 Hope I have described the process clearly for moving the content from Jive to Yammer + O365. My intention not to compare which service is better, but if you are already in Office 365, go ahead and use the O365’s full feature of content collaboration. We are here to move your content easily without disturbing your regular work. Feel free to talk to with us. Looking to migrate from Jive to Office 365? Next PostNext How to use Power BI in the context of SharePoint? How we move JIVE discussion forum and posts to yammer? Any update for my post? Could you please let me know, What is the custom way to retain the timestamp? The post is really helpful. Could you please let me know, what kind of customizations you did to retain the time stamp for jive to yammer?